Afghan President Hamid Karzai defined seven parts of the country that he says are ready to transition to Afghan control in July, when U.S. military troops begin a phased-out withdrawal. 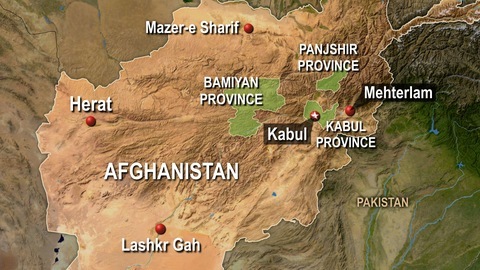 The areas include the capital of the troubled Helmand province, Lashkar Gah. The list also includes Herat, Mazar-e Sharif, Mehterlam and three provinces, Kabul, Panjshir and Bamiyan. Karzai said citizens of Afghanistan “don’t want foreigners to take responsibility for security anymore” following reports of civilian deaths caused by NATO forces. Photographs also came out this week in Der Spiegel magazine showing U.S. soldiers accused of killing Afghan civilians for sport kneeling next to the victims. In a speech at the National Military Academy of Afghanistan, Karzai also touched upon the possibility of negotiating a deal with Taliban elements in the country. “We know that not all of the people who have taken up arms against their country are terrorists,” he said. In recent weeks, Karzai has publicly criticized NATO airstrikes following the accidental deaths of nine boys. Karzai’s second cousin was shot in a NATO raid days later, testing the already strained relations between his government and its American allies. Karzai has said the raids should be scaled back, leading to sometimes high-profile tensions with the Obama administration. 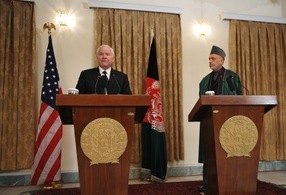 During a visit earlier this month, Defense Secretary Robert Gates said the U.S. plans to conclude combat operations in Afghanistan by 2014 and does not want to set up permanent bases in the country, although the U.S. has said troops may remain in training and advisory roles.